For months now, my colleague Andrew Ujifusa and I have been watching as state legislators react to the December shootings in Newtown, Conn.
We noted the signing of legislation in South Dakota that allows teachers to carry guns to school. We're waiting to see whether South Carolina lawmakers will decide to pay for police officers at every school in the state. Andrew noted the passage of gun-control legislation in Connecticut and New York. While some of these proposals have received a lot of attention, we wondered whether they represented what's really happening in state legislatures. 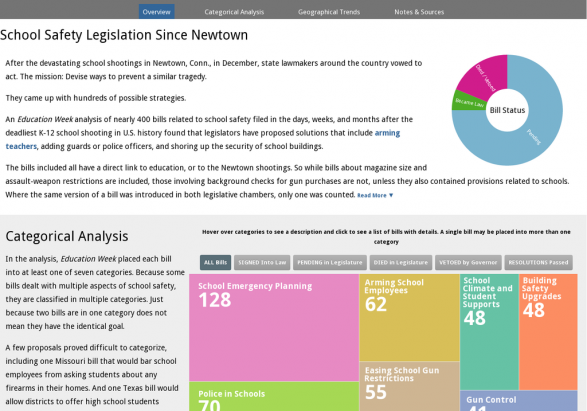 While state legislatures are still, for the most part, in the midst of their sessions and much action could be yet to come—or many proposals will likely die, the fact that there's any action at all is a sharp departure from the U.S. Congress, where very little is happening on the school safety and mental health front. Some examples of state action: In Oklahoma, a new law will requires schools to conduct two drills each to practice for intruders, fires, and tornadoes, and select two other emergency drills to conduct annually, in addition to the two lockdown drills the state requires. A new Virginia law will require the state's public school authority to issue bonds to fund matching grants to school districts to pay for safety equipment. If there's a state-level bill that Andrew or I missed, please let us know. Email [email protected] or [email protected], or find us on twitter @StateEdWatch and @NirviShah.